Some people love their dressing gowns (or housecoats), some people love to get out of their ‘day clothes’ and change into something more comfortable, personally I love to snuggle up on the sofa with a warm, cosy blanket. 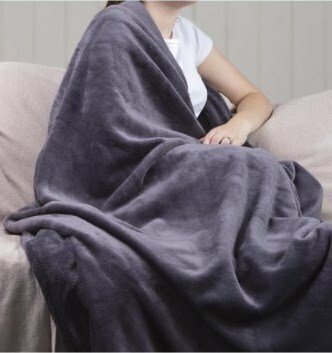 Whether it’s after a long day at work, cold and wintry weather banging against the windows or whether I’m just get comfy on the sofa to watch a film with the kids, I love a good blanket. Did you know that those clever folk over at Heat Holders (the people that keep your feet toasty on cold days or cosy in your wellies) sell blankets? The snuggle ups thermal blanket to be precise. I feel I need to confess something, whilst I love to snuggle on the sofa with Roo and Tigger I haven’t let them use my Snuggle Ups blanket. This is my soft, warm and luxurious blanket, I don’t want it covered in Doritos crumbs and squash so like a bad Mummy I have hidden it away behind the sofa for when they have gone to bed and I then switch blankets. The fur-like fleece has that stroke-ability factor to it, it is so incredibly soft and cosy. The large size means that you can either open it out fully and either place on you bed or cosy up with family on the sofa (well not in my house). Personally I like to fold it in half and wrap it around my shoulders so that I can pop my hands out to type/playing on social media etc. Priced at just £25.oo it is great value for money especially when you consider the size and quality of the fleece,it is available in two colour options; Antique Silver and Moon Rock. Disclosure: We received a Heat Holders Snuggle Ups Thermal Blanket FOC for the purpose of review.